Entering the AAA 400, Jimmie Johnson's 2010 season in the NASCAR Sprint Cup season has been a roller coaster ride. Five wins prior to the end of June, the four-time Sprint Cup champion and his #48 Hendrick Motorsports team were, at one point, in peril of even making the 2010 Chase for the Cup. Since the July race at Daytona, the #48 Chevrolet had recorded 6 finishes of 22nd or worse. Because of this winless streak starting just before his wife gave birth of his daughter Genevieve Marie, Jimmie Johnson had yet to win a Sprint Cup race as a father. Collecting his 3rd pole of 2010 on Friday, Jimmie Johnson attacked the one-mile Dover International Speedway prior to the AAA 400 race. Taking the green flag on Sunday, the #48 Lowes Chevrolet led the first 13 laps of the event before fellow front-row starter AJ Allmendinger in the Richard Petty Motorsports #43 Ford assumed the lead at Dover. Between Allmendinger and Johnson, those two drivers would led 334 of the race's 400 laps. 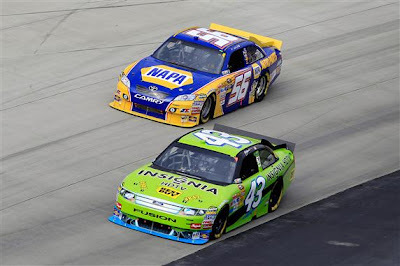 As Allmendinger led the early going of the AAA 400 at Dover, 2008 Dover spring race winner Martin Truex Jr was again showing strength this season in the #56 NAPA Toyota after a 3rd place start. By lap 100, Truex had worked his way into the runner-up place passing Johnson's #48 Chevrolet. Also running well within the first one-quarter of the race event was Juan Pablo Montoya who was maintaining his 5th place starting spot. A very clean event, the AAA 400 was slowed only 4 times by caution and just one of those cautions was because of an accident. On lap 53, an incident involving the #39 Chevy of Ryan Newman and David Reutimann's #00 Toyota resulted in the Toyota suffering more serious damage than Newman's Chevrolet. With two yellow flags for debris and one for a damaged light, the race's flew through 1/3 distance with Allmendinger hold a lead of more than 4 seconds over second place after lap 150. Unfortunately, Allmendinger's hopes of victory were thrown off kilter by a mis-timed pit stop on lap 172 when the #43 car driver cited poor handling as the reason to arrive for early service. What made AJ Allmendinger's stop so ill-timed was the debris caution that would slow the field 17 laps later trapping the #43 Ford a lap down in 27th place. Taking advantage of the wave around to get back to the lead lap, Allmendinger and crew worked hard to regain position but would never challenge within the top-five again in the AAA 400. The #43 Ford would come home 10th in the final running order. Just as Allmendinger's hopes for a Dover victory were ended, Martin Truex Jr would encounter problems shortly afterwards. On lap 208, Truex Jr's day went south when a loose wheel forced the #56 NAPA Toyota to pit road. As the car appears to stall leaving the pits, driver and crew determine a rear axle shaft has broken forcing the Michael Waltrip Racing car to the garage after a spectacular performance in the first half of the AAA 400. Martin Truex Jr would be sent back out on the track to eventually finish at Dover 17 laps down in 34th position. Because of the downfall of Allmendinger and Truex Jr, Jimmie Johnson was effectively on easy street with a very fast #48 Chevrolet Impala parading the AAA 400 at Dover International Speedway. The Busch brothers did provide an occasional change of scenery. Kurt Busch's #2 Dodge would led for 3 laps while the #18 Toyota of younger Kyle Busch led a 46 lap stint through lap 293 to 338. 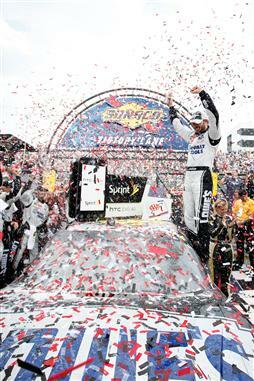 At the end, there was no stopping a hungry Jimmie Johnson planting his #48 Chevy into victory lane at Dover. His 6th time winning on the 'Monster Mile', Johnson finished 2.6 seconds ahead of Jeff Burton on the track. In regards to placement within the Chase points, Johnson now finds himself in second place 35 points behind leader Denny Hamlin. Unable to lead a lap at Dover, Hamlin rolled across the line 9th. As Johnson moved up 4 places in the Chase standings, drivers Jeff Gordon and Kevin Harvick lost positions on lackluster runs. Though Gordon finished 11th, several Chase contenders leapfrogged the #24 car driver at the end of the 400-mile event. Working harder again because of a weak qualifying spot, Harvick's efforts from 33rd to 15th were not enough to prevent a 3 spot dive. Joey Logano and Paul Menard, two non-chase drivers, also enjoyed some very respectable finishes in the AAA 400 at Dover. The track where he made his NASCAR Nationwide Series debut just a little more than 2 years ago, Logano finished 4th in his #20 Home Depot Toyota. Menard, teammate to longtime race leader AJ Allmendinger with Richard Petty Motorsports, come home 7th leading the team's efforts. Next for the NASCAR Sprint Cup tour is the Price Chopper 400 at Kansas Speedway with the green flag dropping on Sunday 1 P.M.